Hi, I welcome you to our news channel. It is our desire to bring the very latest and recent news that may negatively impact and impair your well being. 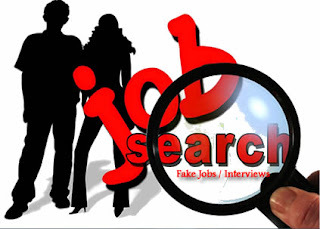 There are so many job recruiters out there particularly in different parts of Lagos with various strategic means of exploiting and extorting innocent job seekers fresh graduates. "Just at the break of a new year I decided to apply for job as my present situation demanded. I applied through a mobile application tagged 'JobcityNigApp'. Within space of 24hours I got more than three invitations for assessment and interviews from companies I never applied to. In summary, I confirmed that those packs of fools are time wasters, demanding for money in a very ridiculous approach from helpless job seeker that possibly must have had it rough to arrive at the interview center in hope for a better future. I think it is important for Nigerian Police Force to intervene into this situation." Ok please, if you experienced the same situation in recent time, kindly leave your comment here to help educate others that may be victim of these scumbags.